I'm someone who prefers to wash my hair every day, unless I'm wearing it curly... which rarely happens. My hair, like my skin, gets greasy really quickly - by day two, the roots are definitely showing oil. But there are days where I'm getting home late, and when I count ahead to the number of hours of sleep I'd get if I woke up to wash and style my hair, it's just not enough. I also use a feeding tube overnight to make sure that I get enough calories in, so I have to make sure I am hooked up for enough hours that I'm getting the right number of calories. On those days, I rely heavily on dry shampoo. I'm really happy with how much dry shampoo has improved since I was a kid. When I was young and in the hospital with pneumonia, they would give you a very old-school kind of dry shampoo that didn't really do much to feel or make your hair look clean, and scared me off dry shampoos for years! But dry shampoos has come quite a long way since then, and I've learned that applying it the night before is really key, before your is greasy. For years, I relied on Batiste dry shampoo, and I still think it's a great drugstore staple - you can't beat the price! But it's really powdery when it comes out, and I felt like I was feeling it on my hair and then on my fingers the whole next day, until I washed my hair again. So I decided to try out two newer, more high-end dry shampoos: Drybar and Amika. After a few different tries of each, I have to give Drybar the number one spot. I am already obsessed with Drybar in general, and love that the dry shampoo makes my hair smell like it does after a blowout! It's not too powdery, and it doesn't have too much of a white tint - it rubs in really well. The only con is the price - its $23 for 3.5 ounces. 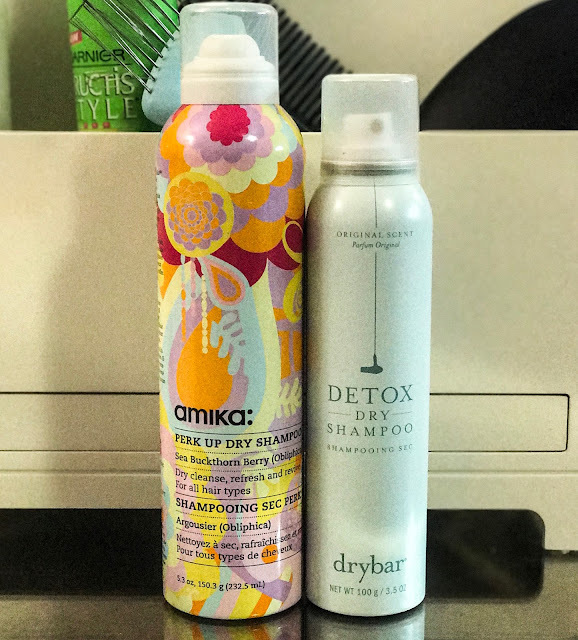 The Amika dry shampoo is a close second, and is $22 for 5.3 ounces, which is definitely a better deal. It's also not powdery or white, and rubs in well. The scent is pleasant - not as strong as the Drybar scent, but that's not necessarily a bad thing! The only issue I had with it is that I didn't think my hair felt as clean as it did with the Drybar. It still looked nice, but just felt greasier than I wanted it to. I'll definitely still keep the Amika around, though! Do any of you have a go-to dry shampoo? Let me know in the comments!